Real Madrid couldn't have started their Champions League campaign in a better way, as they've hosted Shakhtar and completely demolished the Ukranian side in a 4-0 victory. Cristiano Ronaldo was once again the main figure in another European night at the Bernabéu, after scoring 3 consecutive goals in less than 30 minutes. 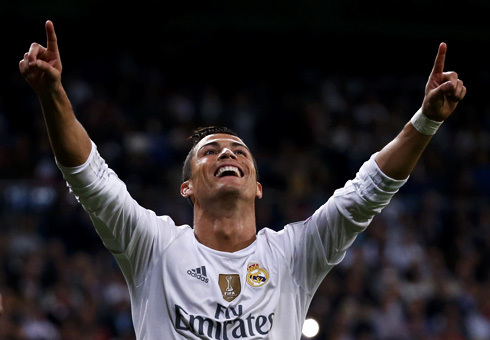 Another game, another clean sheet for Navas, and another Cristiano Ronaldo hattrick. Real Madrid got off to a great start in this season's edition of the UEFA Champions League, as they romped to a 4-0 victory over Shakhtar Donetsk this Tuesday night at the Santiago Bernabeu. The opener was delivered by Karim Benzema still around the first half an hour of the game and then Cristiano Ronaldo made sure to put the scoreline in more expressive numbers by scoring a hat-trick in the second half, with two of those goals coming from the penalty spot and the other from a short-range header. Real Madrid will now refocus in La Liga, as they'll be hosting Granada next Saturday afternoon, again at the Bernabéu. Rafa Benitez brought in a few changes to the side, with both Raphael Varane and Toni Kroos retaining their positions in the starting lineup. Real Madrid looked good from the start, even though some spotty finishing would keep them from opening the deadlock as soon as they would have wished. Ronaldo, still fresh off his 5-goal performance against Espanyol on the weekend, looked particularly sharp on the ball as Real Madrid began to break the Ukrainian side down. It would take a mistake however for the Merengues to score, when a mix-up at the back led up to the ball falling perfectly at the feet of Karim Benzema. The Frenchman wasted no time placing the ball into the back of the net and gave the hosts the much wanted lead at the Bernabéu. Real Madrid would continue to press but unsuccessfully, as they went into the halftime break still 1-0 up. 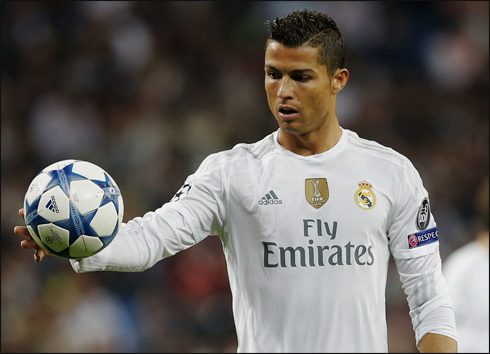 The game would open up after the break, as Cristiano Ronaldo completed his second-half hattrick. Two goals from the penalty spot (one deserved, and one coming from a horrible call by the 5th official) would get him started. And he would finish Shakhtar Donetsk off with a header, right after Marcelo's shot rebounded off the goalkeeper. 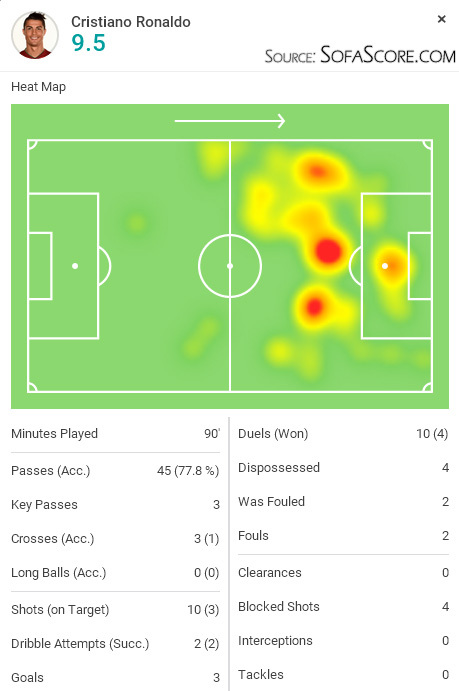 As we can see from SofaScore's player ratings card in the image above, the Portuguese star had plenty of attempts this Tuesday night (10 in total), but ended up only hitting the target and scoring in 3 of those. For Ronaldo, it's been 8 goals in his last two games and with Granada coming up this weekend at the Santiago Bernabéu, (remember he already scored 5 against them late last season) he could be in for some more goals. Cristiano Ronaldo next game will be for Real Madrid on the 19th of September of 2015, against Granada. You can watch Juventus live stream, Real Madrid vs Granada, AS Roma vs Barça, Chelsea vs Maccabi Tel Aviv, Dinamo Zagreb vs Arsenal, and Olympiacos vs Bayern Munich, all matches delivered through our live soccer section.